xbratx99 :: Jackson's First "Angelversary"
xbratx99 :: Molly is online! It was one year ago today that Jackson went to heaven. If anyone wants to leave messages, here's the place to do it, or you can visit Jackson's new memorial site and light a candle. I've written a little this week, but not much yet. Here is Jackson's memorial page I started. I hope everyone likes the song I picked out, I'm sure I'm not the only one wondering who he would be today. If you haven't done so already, please sign this CHD Awareness petition in honor of Jackson! Later in the day, I heard this song, also one I have listed in my "angel song" blog, I've finally been working on compiling all of those songs, but not all of them are available with pepsi points! I don't know if I ever even wrote about this last year. Saturday, June 16, the day before Father's Day. Scott and I went to his parents' house for the day. On the way up, it rained a little, and then the sun came out. I was just staring out my window, and I watched as a perfect rainbow formed. Remember, this was after the comfort care decision was made (June 12). So we knew it wouldn't be much longer. But I felt such a sense of peace when I saw that rainbow, I don't even know how to describe it. That rainbow is the background of the collage picture of me and Jackson. Fast forward one year. Almost exactly one year, oddly enough. Again, the Saturday before Father's Day, but June 14. This time was a day trip to Scott's cousin's house. It stormed that day, various areas around Chicagoland. On the way home, there were times we drove through some rain while the sun was still shining. This one took more looking, but I finally found it. Unfortunately, in my state of awe/shock, I completely forgot that I had my real camera with me, so this is from my cell phone camera, and it's the only picture I got. It was a full perfect rainbow though, and so beautiful. On Sunday, April 27, 2008, I will be walking 6 miles along the lakefront of Chicago to show my support for the March of Dimes. Last year, I walked to honor Jackson's fight for his life in the hospital. This year, I am walking to honor his memory, and all of the other Angel Babies and Fighters I have come to know and love over the last 2 years. ~First, I am asking for more walkers to join our team! We have 5 Team members so far. You can join our team even if you don't live in the Chicago area, just change your walk location after you sign up! Don't have anything to do on April 27?? Join us! It was a lot of fun last year, and the 6 miles actually goes by so fast you don't even realize how far you are walking! Not all walks are on the same day, they are spread out over the spring and summer, so if you are not in the Chicago area and want to walk, check your local walk site information for the date! ~Second, I am asking you to show your support for our team and our mission to help March of Dimes by forwarding this email to your family and friends! ~Third, Sponsor our team or the individual walkers by making a donation! All of our walkers' progress banners are here: http://xbratx99.livejournal.com/17354.html Just go there and click on the banner of your choice and you can donate by credit card or PayPal, and you immediately get your receipt for your tax deduction! Want to donate cash or check? Let me know! ~Lastly, Keep your fingers crossed for another beautiful day for our walk!! Last year the weather was absolutely GORGEOUS!!!! Hoping for the same this year! Thank you SO much for anything you can do to help us Save the Babies!!! 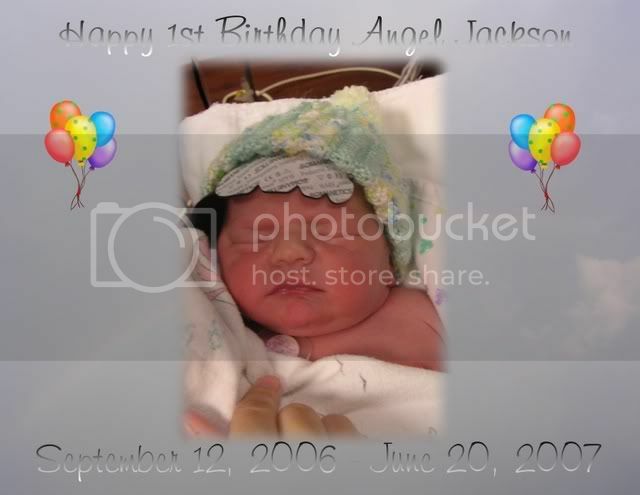 Jackson has been included in the 2008 CHD Angel Calendar. His page is the month of September. If anyone would like to purchase one, click the calendar cover below. You can view each page in the calendar by clicking the picture too. 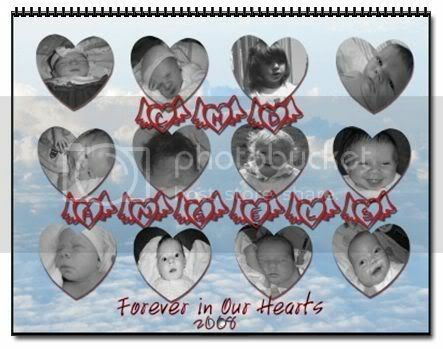 Profits from the calendar will go to organizations for CHD Awareness, Research, Support, and/or Children Hospital CICU's. The cost for each calendar is $20.29. One year ago, on September 12, 2006, at 9:30 in the morning, a little angel arrived. Little did we know he was only to be here for a short time, but he was sent here to do so much for us, his family and his friends. As Jackson's first birthday draws near, I am thinking so much of the past year, and all that has happened. It still seems so unreal, hard to believe that he's really gone. I still think of him often, I still wear red every Wednesday, every month anniversary, and I still have the heart necklace for him. I've been thinking about checking into getting it engraved, but I'm not sure if it's wide enough. We'll see. I have some ideas of some pictures I want to make for Jackson for his birthday, and I have a plan for Wednesday morning that I will be doing. I'll share that later though. I started this post for a specific reason, I thought some people might want a place to send Jackson birthday wishes, and messages of support to Jake, Sara and Molly, since I know this day will be very difficult for them. Also, if any of you "tag makers" out there want to make a birthday tag for Jackson, feel free, and you can send them to me or post them here. I have a couple ideas for some too, might try and get those done this weekend. If I get an update today I'll be a little quicker about posting it!! Adam still needs some prayers! Yesterday morning Susan called me, recovery was going ok, they had taken him off the vent on Saturday, which was great. Unfortunately, he was running a fever, so they had him on antibiotics and are testing some cultures. Hopefully nothing too serious and the medicine will get rid of it fast! But because of the infection, I didn't get by to see him yet. I'll wait till he's better, don't want to risk anymore complications! Well Susan said she'd call again today with an update, so let's hope that he's better already and his stay isn't too much longer! Happy Monday everyone, have a good week! There is a picture of Molly on the radio website from the radiothon on Thursday! I just talked to Susan, Adam didn't get to have his surgery today! They were just getting to the hospital early this morning when a heart came in for a transplant, so of course that got bumped to the head of the line! Adam is first on the list for tomorrow (Friday) morning, so keeping thinking about Adam and his family! Susan said she'll try to update his carepage (page name: adambrodersen) tomorrow but she might just call me to send an update. Depends on how things go. She said thanks for all of the thoughts and prayers too!! Tomorrow (Thursday) Baby Adam (picture of me and him below!) will be having his 2nd stage surgery for HLHS (the Glenn). He did great after his first surgery and wasn't in the hospital for long afterwards, so everyone keep him in your thoughts and pray for an easy surgery and quick and easy recovery!! If you want to leave any thoughts for Adam and his family, you can do so here and I will make sure they get them! !